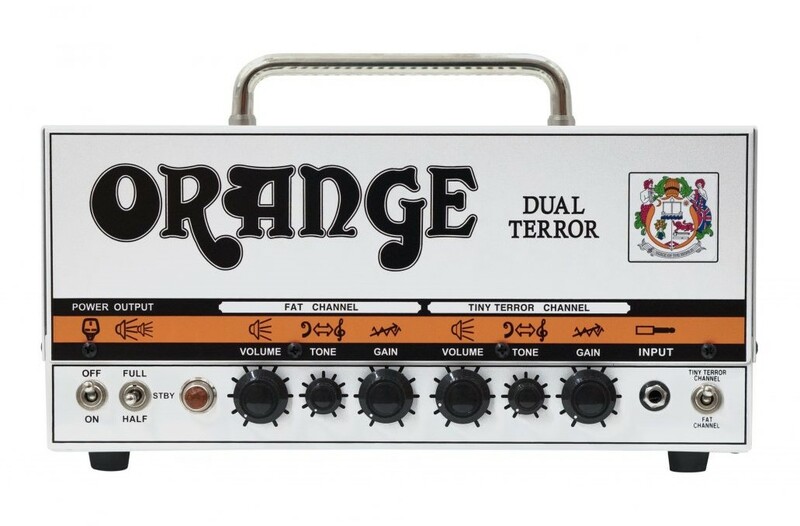 Dual Terror, Tube Guitar Amp Head from Orange in the Terror series. This is a great little amp but it is made in China which is a big let down. Well this amp is the two channel version of the regular tiny terror. You get the same tone and everything but just an added channel. For the size of a lunch box this little amp pacts quite a kick to it. 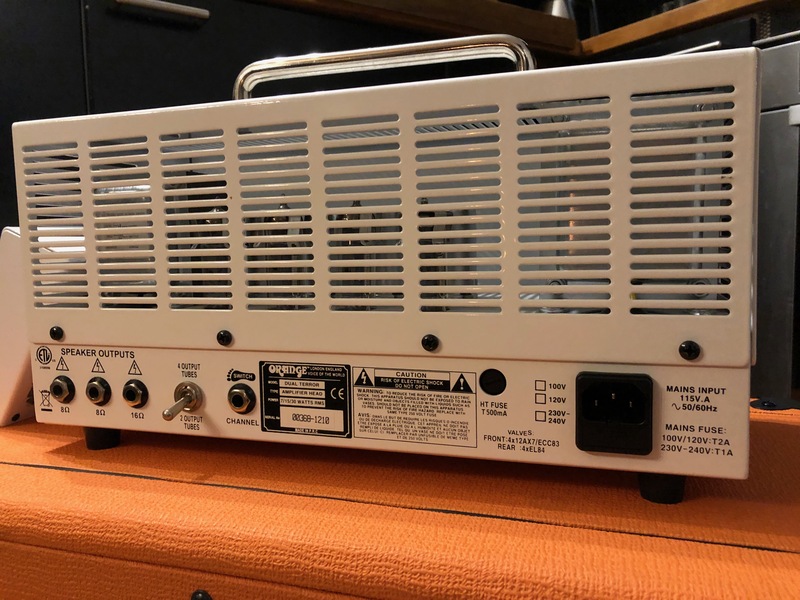 This amp looks like something you would walk to school with and be carrying your peanut butter sandwich in. Orange has taken such a small but positive approach to lunch box style amplifiers. There seems to be a trend going on with manufacturers hitting a market that seems like a good entry way into their flagship amplifiers. The amp has that familiar British grind that you found in the 60's and 70's went they were the leaders in getting high gain sustain from their guitar rigs. This little box does what a full stack can do in a pint size proportion. It sounds fantastic and gets chewier and smoother as you hit it harder with more volume. Controls: Independent Volume, Tone and Gain for each channel. 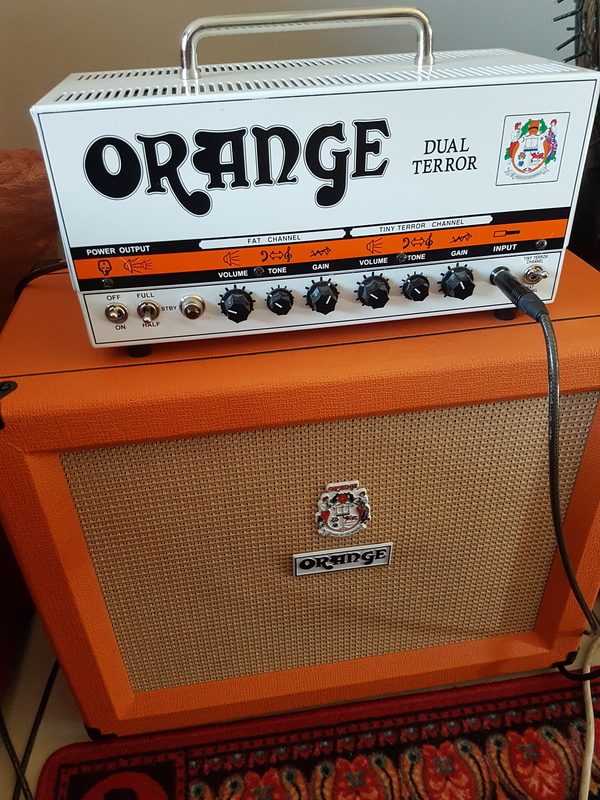 Though the Orange amps have a familiar British flavor to them I think that anyone would be surprised at how big and bold the tone is from this small box. Though is is rated at only 15 watts it gets quite loud and will accompany most small clubs or gigging situations quite nicely. Is sounds as huge tonal wise as any of the larger more frequented amps that Orange makes. With the adds second channel you can get a good clean tone and switch over to the distortion channel. Try this guitar out with a Les Paul and you be pleasantly surprised out how meaty the tone is from simply a Gain, Tone, and Volume knob. This thing can be dropped down to a 7 watt operation for home use or even recording. It sounds great in either setting you have. At new these amps come in at around $899. Sort of expensive for a China amp in my opinion. I would recommend getting a Peavey made in the US before spending the money on this amp. If you save a few hundred more you can get a real Orange amp made in the UK. tremonti's review (This content has been automatically translated from French)" An almost flawless!" Amp head with 2 channels of 30 watts (7w and 15w in splittable I will return) tube (EL84). 3 knobs: gain, volume and tone. A stand-by, a channel selector. No effects loop (too bad but consistent with the spirit purely vintage). Configuration could not be more simple, no need for manual: one branch is allowed to warm up and we play! The sound is right there, just have to equalize with the "Tone" to go to a more matte over glossy. Then I put 9 because perfection is not of this world but when it's the sound you want that say? One must consider the amp for what it is, namely a box overdrive! The ideal is a guitar, a cable and direct in the amp! Therefore to you its the blues, rock, hard rock based guitar course. With the Flying V I quietly from blues to hard with the knobs on the guitar, while with my Strat copy (Tokai Goldstar) I'll get sound on the edge of overdrive Hendrixiens crunch up, the big blues. The Dual Terror has no apparent many settings, provided it is possible to draw a lot of different sounds ace: from 4 to 2 tubes (switch back) or 30 to 15w and you play on power, dynamics and fullness of sound. 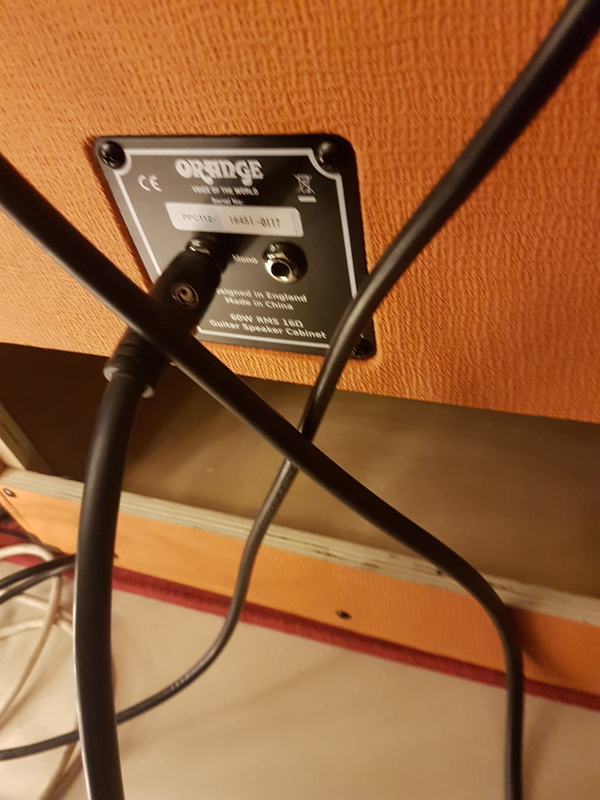 Therefore you will realize that the beast turns into a very versatile style "rock" at large and by switching from one channel to another you can spend a warm and clear channel for the funk to a channel "big overdrive" for the Gun's and others. Again with a boost, overdrive, equalizer upstream, the range widens. I use it for over a year now and I do not regret my purchase. I had the Tiny Terror before and I wanted to take advantage of this to its greater volume and switch between two channels, one clear and one overdrive. In exceptional portability (7kg if I remember correctly) with its cover I can take it anywhere. 15 or 30 watts requisitioned ', 7w at home (although careful when going from 30 to 15w sound is not divided by 2, it is reduced, the texture changes but not as drastically as expected), it I use as a distortion box live (I spend a Peavey head for clean sounds to DT for overdrive with a A / B box), amp requisitioned 'in the studio and working at home. 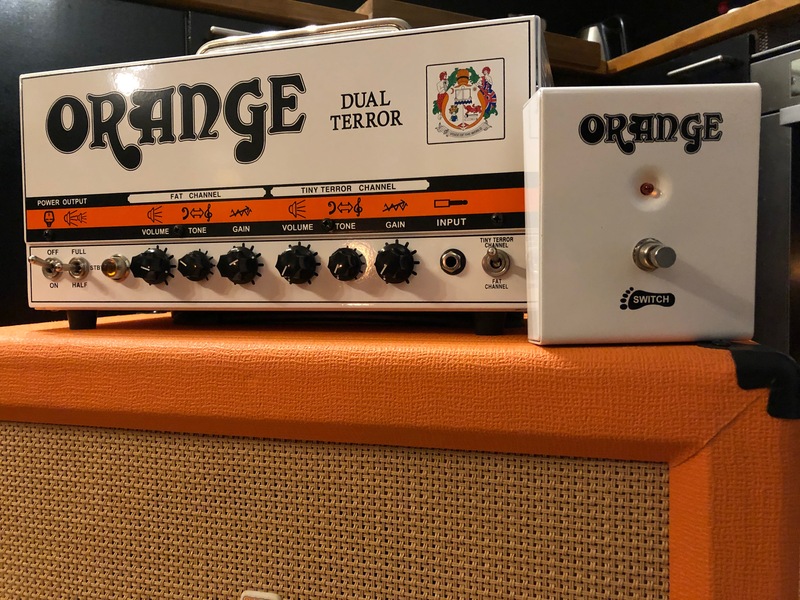 Shame about the effects loop (especially in Orange has a Dark on Terror even if it's true that it's not quite the same philosophy ...) but it is I think the only regret I could have both the gear I like. If you love vintage and rock sounds rather rough around the edges, do not hesitate! Dual Terror is a 2-channel amplifier of type Class A. It benefits from 4 lamps to the ECC83 preamp and 4 EL34 tubes for power. The power of the amplifier is splittable into 7, 15 or 30 watts. It y '3 speaker outputs, two 8 ohm and 1 of 16 ohm. A jack for the channel switcher and channel Tiny Fat. There is no effects loop. The configuration of the amplifier could not be simpler, for each of the two channels we have 3 pots, gain, tone and volume. To this is added, slamming the big switch. The former are on the front. From left to right we have the classic "On / Off" switch comes after "Full (15 or 30 watts) / Standby / Half (7 or 15 watts)" Then, at the extreme right of the head we the selector of channels and finally on the back of the head we have a switch that activates either 2 or 4 power tubes. The manual does not exist, but frankly not necessary, here we are in the category plug and play, you plug it plays, it sounds! And little more Gig Bag, super convenient! I play in Group Power Rock, the dual feel so "at home"
I think for the blues, and jazz, it can do so, the amp is very versatile, I even want to test it in my group of brutal death with a guitar emg if granted, I think that can give something interesting. Well, it's tiny and better, as the amp is more powerful, was more reserved before cruncher, you can claim a real clear sound at high volume. It's warm, round and very dynamic, the receiver reacts hugely to attack, I love it! However, a lover of Fender change its crystalline way. For the rest, you refer to the opinions of Tiny Terror! So the tiny boost, I personally do not like the turn that takes the distortion after 14h on Knob gain, the sound gets pretty messy, but it is a matter of perspective, if you like distos type fuzz, I think you'll like it. For my part, as I said above I use it set to 14h, it gives us approximately the distortion found on the tiny channel when pushed to the bottom with a little more body. For solos, I slightly inflated my sound with a compressor Electroharmonix black finger, and there, with dose sustain more, it's totally magical! I use it now for 1 week. I played a lot of time on high gain amps (Marshall JCM 2000, Peavey 5150, ENGL Powerball), I wanted to return to a more "roots" more rock with a more limited power to qualify for the potato from the lamps. Until now the style amps Tiny Terror, Night Train, Rebel 20, does not allow for a real clean sound at high volume and well with the Dual and the 30 watts is now possible. The absence of effects loop, yet does not bother me more than that, but when I think about investing in a real delay pedal, certainly I will bring the head in a tech to do the edit. I find excellent value for money, 622 euros in general for an amp of this quality, do not hesitate! I do not have enough perspective on the product to say whether I would do this choice, but what is certain is that it suits me perfectly for the moment. Orange has announced the ‘Dual Terror’: a twin channel, 30-watt head, switchable from 30 to 15 or 7 watts.